Words into action. Boaz didn’t just say positive and encouraging things to Ruth, he acted in them. Read Ruth 2:13-14. 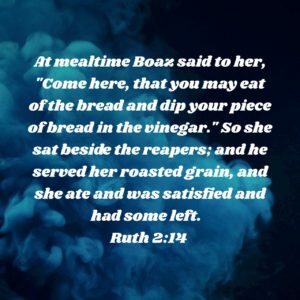 At mealtime Boaz said to her, “Come here, that you may eat of the bread and dip your piece of bread in the vinegar.” So she sat beside the reapers; and he served her roasted grain, and she ate and was satisfied and had some left. He told her to stay near, but then he followed that up with actions that demonstrated the care that he had been promising. He provided for her needs. He became the answer to the prayer he had just prayed. God used him to show Ruth compassion and to meet and care for her needs. Who do you need to demonstrate God’s love and compassion to? How can you meet people’s needs today?